Thing is blockchain based projects should be just that, blockchain. However, a new study by WhiteBlock sponsored by ConsenSys whose founder, Joseph Lubin, is a wheeler dealer at Ethereum reveal otherwise about EOSIO claims. Though EOS is known for their blazingly fast speed thanks to their dPoS and block producer architecture it is now emerging that it is not a blockchain per say but a “homogeneous” database. A level deeper and WhiteBlock conducted benchmark tests demonstrating that EOS transactions are not cryptographically validated. What’s worrying is that EOSIO, WhiteBlock says, cannot process millions of transactions as previously marketed. Rather, EOS can process 50 TPS at optimum printing lower speeds at peak when latency and packet losses are factored in. In the meantime, Bancor, an on-demand decentralized liquidity network, has launched BancorX making it possible for cross chain interaction between ERC and EOS tokens via their BNT tokens. This is incredible for both network as it means higher liquidity and security as tokens need not to pass through exchanges. After weeks of reds, ETH/USD performance is moderate and up 7.5 percent in the last week. On a day to day basis, ETH prices are stable printing 0.6 percent in the last day. Still, we expect ETH/USD to expand in coming days as the SEC plan to publish an ICO guidance for coin issuers and as bulls seek to reverse this year’s losses. Following losses of Sep 5, ETH/USD has been moving in a narrow $110 range with lows at $160 and immediate resistance at $250. While prices consolidate horizontally, it is pretty hard to make calls unless of course there are strong gains in either direction. This is so because we have conflicting positions. On one hand losses have been steep–+75 percent losses from 2017 highs positioning bulls for further gains. Yet on the other side we have the bear break out pattern of Sep 5 backed by high trading volumes being the main obstacle against buyers. Comparing Sep 5 volumes—595k and those of Oct 15—967k, there is a clear disparity. All things constant, this is bullish. It is even stronger with the failure of sellers to close lower confirming Sep 5 and Oct 11 losses. The lack of price movements in the last two months was mostly because of a consolidating market. Though Nov 4 bar points to underlying bulls, the ETH/USD market is largely in range mode. As such risk-on, conservative set of traders need to wait for confirmation of the bear break out pattern of Sep 5 or the cancellation of that price pattern once ETH/USD race above $250 and even $300. Regardless of the prevailing sentiment and the expectation of ETH/USD reversal due to this year’s losses, patience is key. In this case, risk-off, aggressive set of traders can buy at spot with stops at around $190 or Oct lows. On the other hand, conservative traders should wait for prices to race above $250. Thereafter they can begin buying on dips with first targets at $400. This is not trading Advice. Do your own Research. 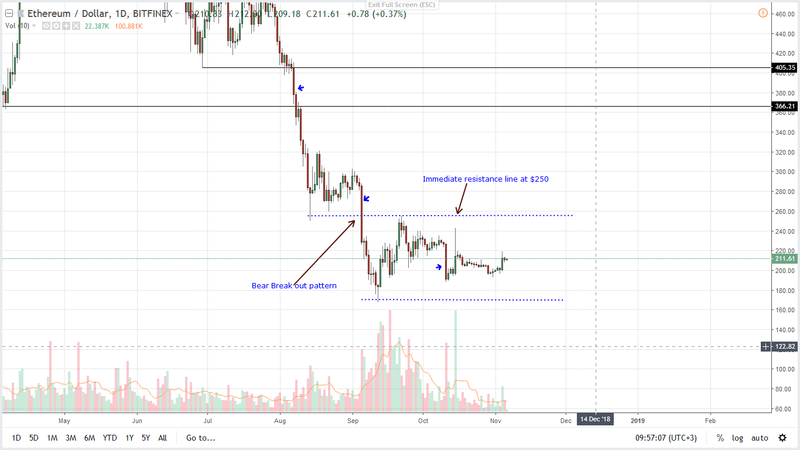 The post Ethereum Price Analysis: Despite Upbeat Preview, ETH/USD Bearish Below $250 appeared first on Ethereum World News.